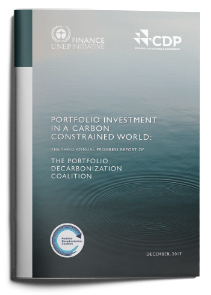 The third annual report from the Portfolio Decarbonization Coalition (PDC) examines the progress made by its members in assessing and taking investment action on climate-related risks and opportunities, and by extension, in decarbonizing capital allocation and portfolio design worldwide. It provides an introduction to the coalition, and an overview of the decarbonization approaches and strategies of its members, illustrating how PDC signatories’ portfolios are increasingly becoming more carbon-efficient and better aligned with the low-carbon economy. Members share experiences, and the report offers suggestions on how governments, investors, and investor platforms can accelerate the process of portfolio decarbonization. The Coalition now convenes 32 investors overseeing the gradual decarbonization of a total of more than USD 800 billion in assets under management. This has dramatically surpassed the Coalition’s original target of USD 100 billion by 2015. Find out more about the Portfolio Decarbonization Coalition here.